Last night we got a call from my father-in-law. It was 10:45 p.m. After milking, he’d walked out of the barn to see a huge flickering glow in the sky towards our place. They hopped in the car for the five-mile drive, thinking it could have been our barn or a neighbor’s. We headed outside to see the sky burning. We walked to the top of the hill and thought it must be neighbors over yonder, but no. Folks from 40 miles away could see this fire and everyone thought it must be just over the hill. As it turns out, the fire was 10-12 miles from us as the crow flies. 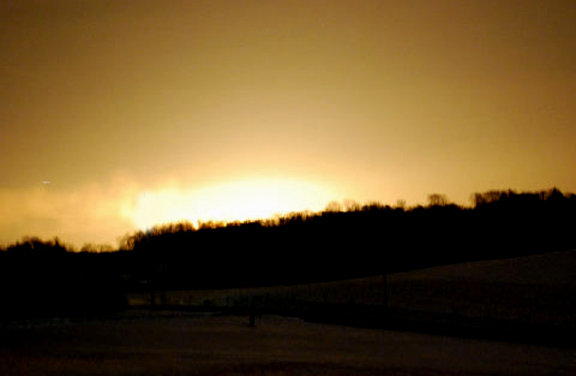 A section of the Tennessee Gas Pipeline exploded in Columbiana County. Here’s a photo forwarded by a guy at work … compare the height of those flames to the silos and tree tops! There’s a video here, if you’re interested. Oh was it scary! It was about 3 miles from us. Brock was still up and said it looked like a mushroom cloud, he thought it was an atom bomb! To hear his yells, we thought our house was on fire. Yikes, a scary night. Praying for the Zehentbauer family. I think pipeline explosions are terrifying.